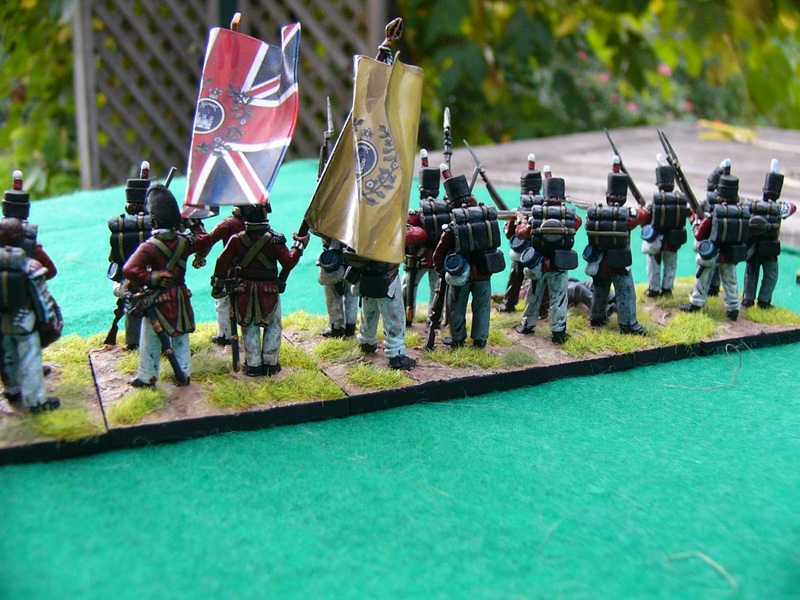 Many moons ago I acquired a bag of 28mm Old Glory Perthshire Volunteers (from their British in Egypt Range). 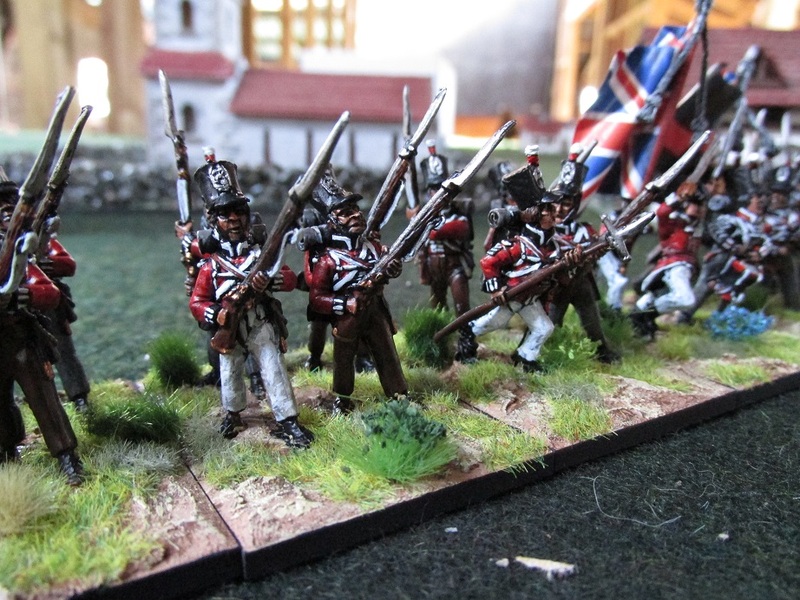 I had vague notions of using them for some militia unit for my War of 1812 Canadians. They sat in their bag, stashed in an old box until a few weeks ago when I dug them out again. These are big Old Glory figures. Most are 28mm to the eyes and some 30mm. Great casting, good detail and with no backpacks – so nice to paint. 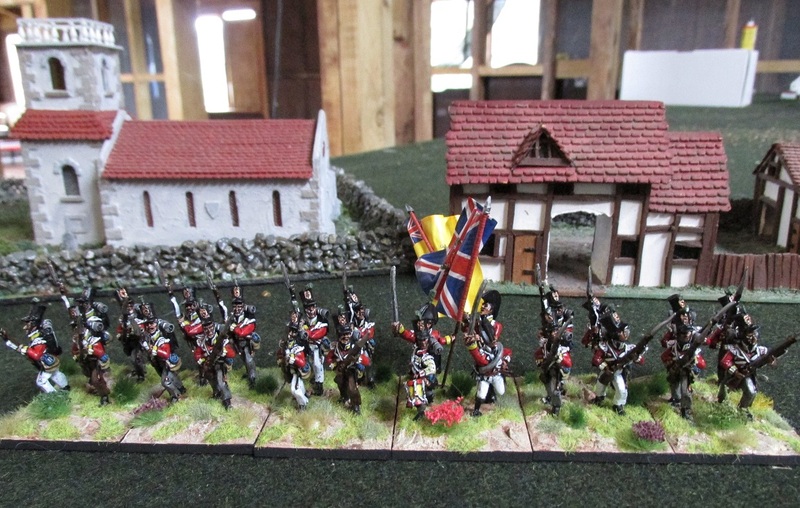 They have been reborn as the Loamshire Volunteer Regiment of Foot, a unit that my exhaustive research has discovered was regularly brigaded with the South Essex (later the Prince of Wales Own Volunteers) and who fought at such famous battles as Talavera, Fuentes des Onoro and Salamanca. Raised in 1806 as a patriotic gesture by their wealthy Colonel, Sir Edward Blimp, they are recruited solely from men of their home county, the green and pleasant Loamshire. Unlike most regular British units the Loamshire Volunteers still wear the Tarleton helmet. 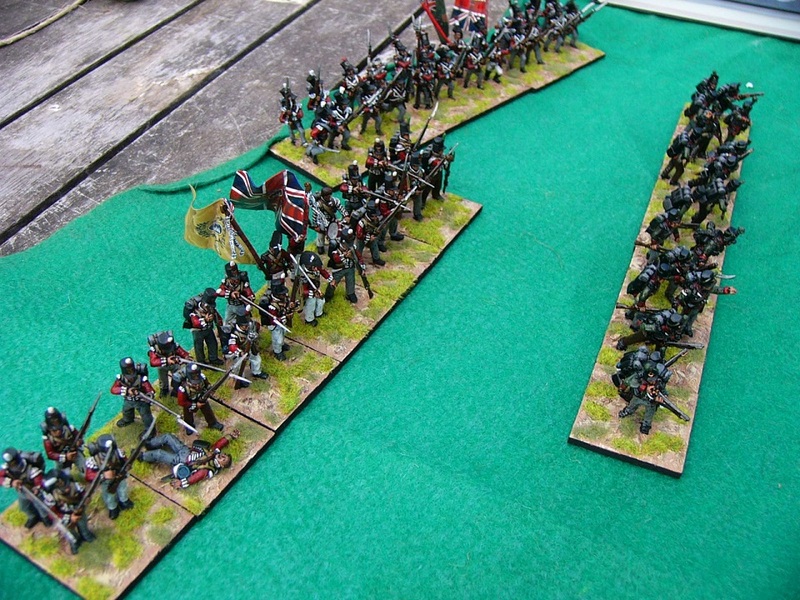 The grenadier and battalion companies have a red turban, while the light company sports the traditional green). Another variation is that while they are a regiment of foot, their dress mirrors that of regular light infantry, with wings being worn by all companies. 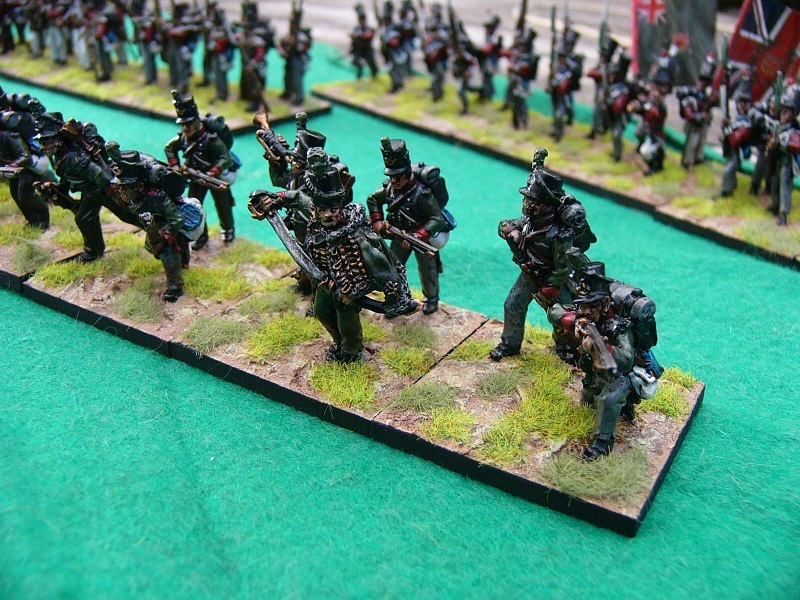 Normal line infantry company plumes are affixed to their leather tarletons (green for lights, white for grenadiers and white-over-red for battalion companies). The Colonel of the Loamshires, Colonel Sir Edward Blimp, dislikes drums so his musicians are all buglers. The Loamshires carry two colours, a King’s Colour and Regimental Colour matching the blue facings of the regiment (flags are downloaded from http:www.warflag.com and modified a bit in MS Paint). The Old Glory bag comes with only one standard bearer so the second officer in the set became an ensign. My latest unit completed this week. More Old Glory. Old Glory figures come in bags of thirty figures. 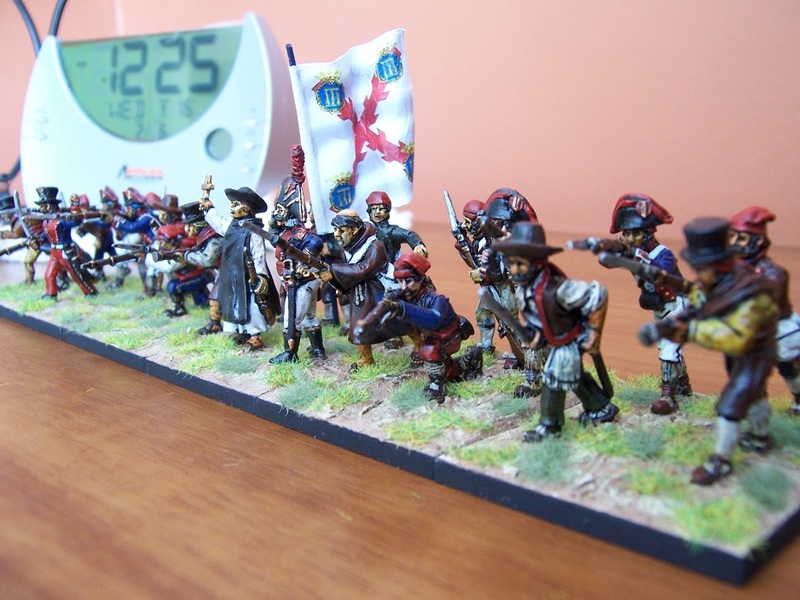 It is quite easy to end up with a lot of extra figures, depending on the size of the units you are making. 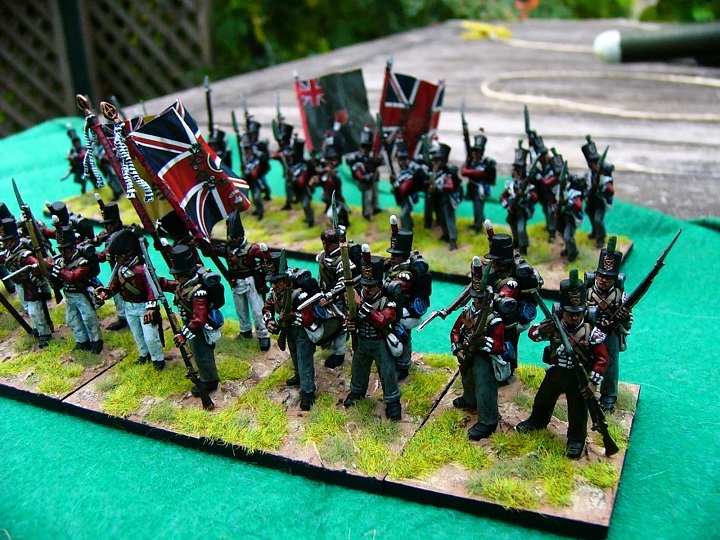 More than ten years ago I brought one bag of British 1809 Elite Company Defending to provide the flank companies for units I was building at the time. This photo from Old Glory Miniatures shows the raw metal. There are two poses in the pack with head variants that have a lot of character. When I said ‘at the time’ it is not as if I got anything done with them back then. I brought the metal but it is only now that paint is being applied. Anyway, I ended up with a lot of flank company figures left. 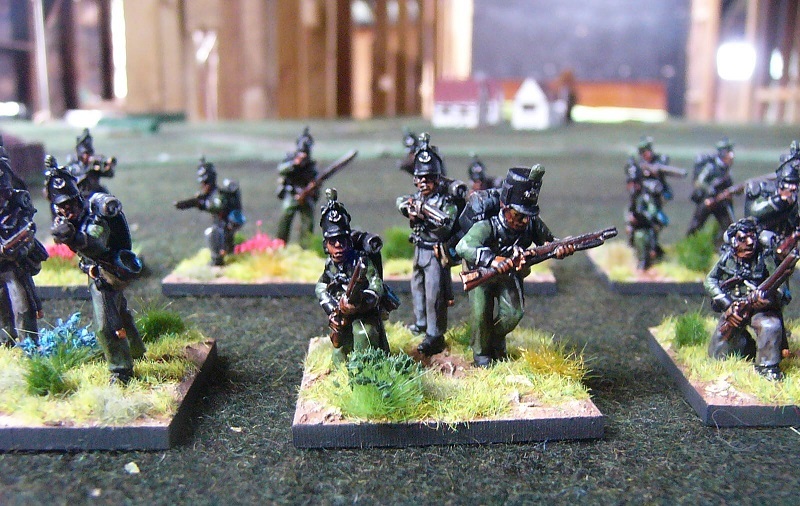 So I decided to make yet another Light Infantry battalion (already have the 52nd and the 43rd). This time it is the 85th Regiment. 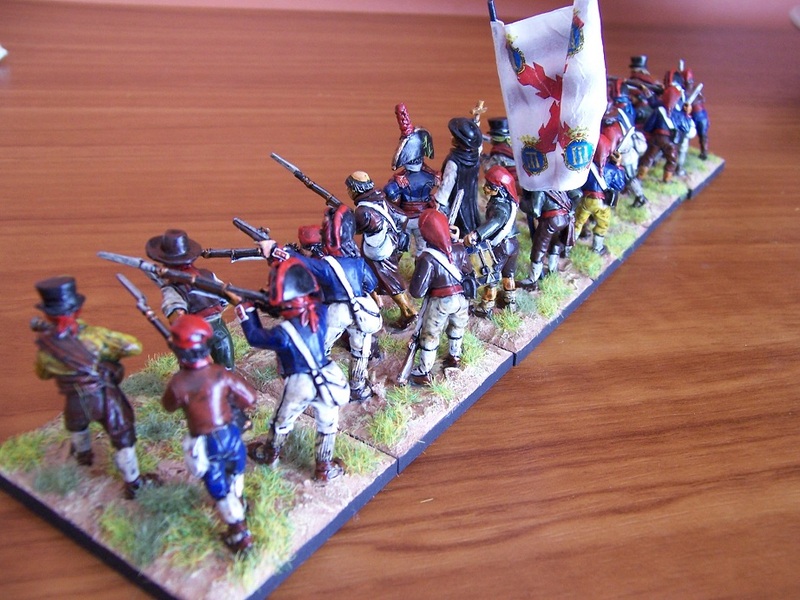 The command figures come from the British 1809 Command and NCO bag. The metal flagpoles in the hands of the ensigns are quite soft so I cut off them off, drilled out hands and used wire to make new ones. The flags are not correct for this unit. 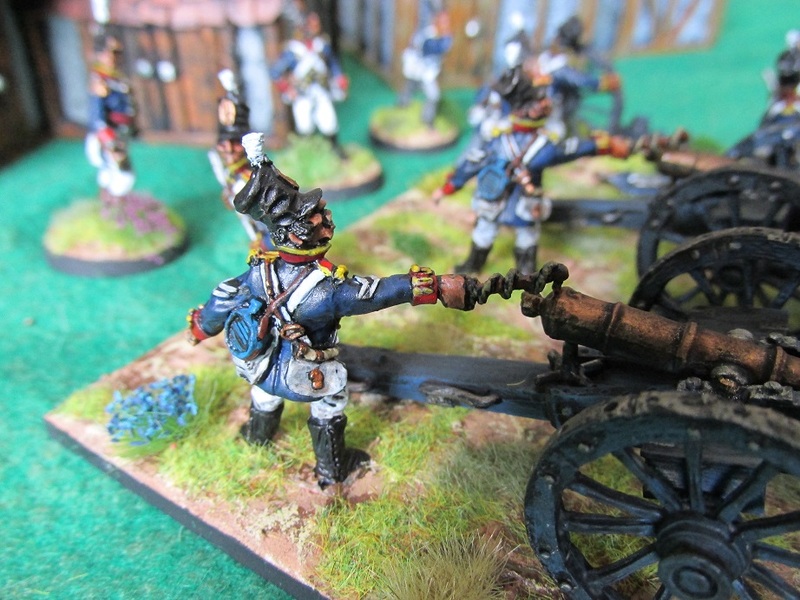 I tried to model them flapping enough to obscure the regimental number. I suppose that technically, being a light infantry regiment they didn’t carry their colours into battle but what fun would that be. The 85th was raised in 1793 by George Nugent, their colonel, in Buckinghamshire for service during the French Revolutionary Wars. They first saw action in the Netherlands, before moving to the West Indies. 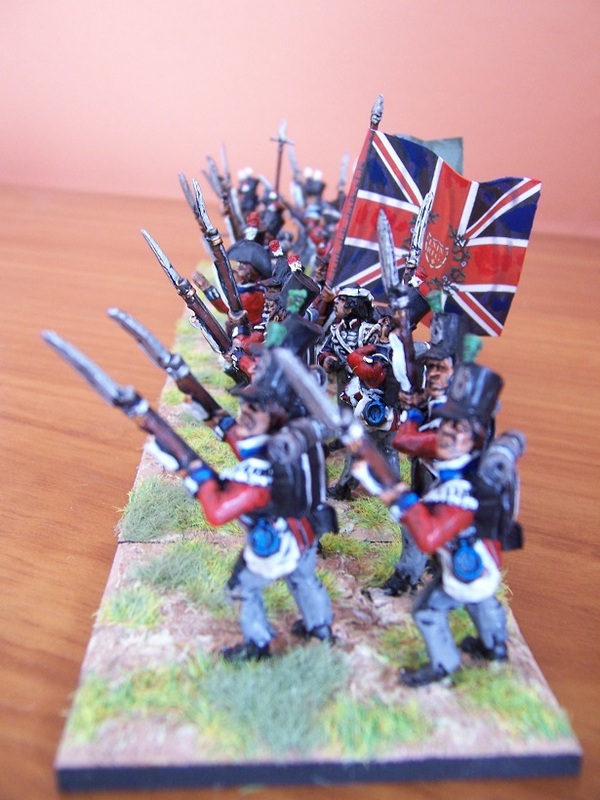 In 1806 they returned to Britain and converted to a Light Infantry role, renaming as the 85th (Bucks Volunteers) Light Infantry. Two years later they were serving under Wellington in the Peninsular campaign and fought at Fuentes de Onoro and Badajoz. In 1814 they were dispatched to America and saw action in the last phase of the War of 1812. [from Wikipedia]. 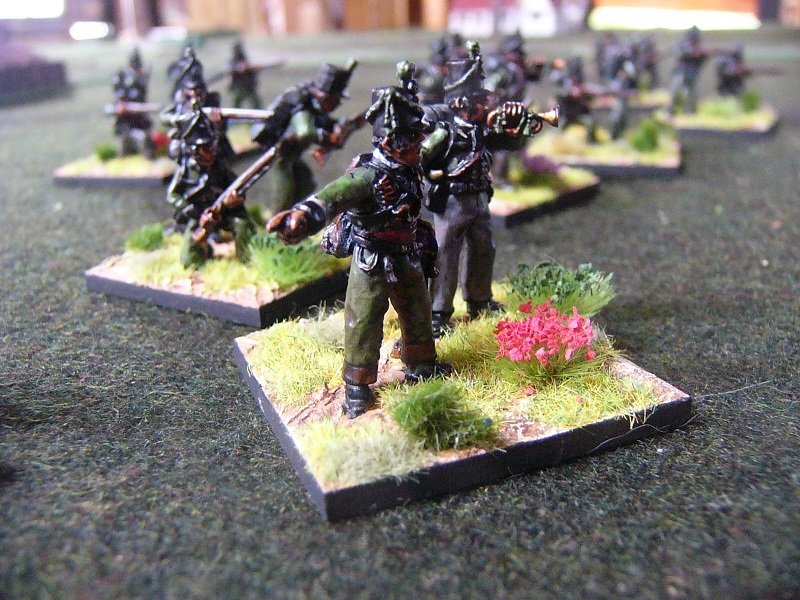 My latest British battalion. It probably shows but it took me three days to paint this battalion. I probably could have taken more care but I wanted to get these Old Glory battalions ready for the table top. 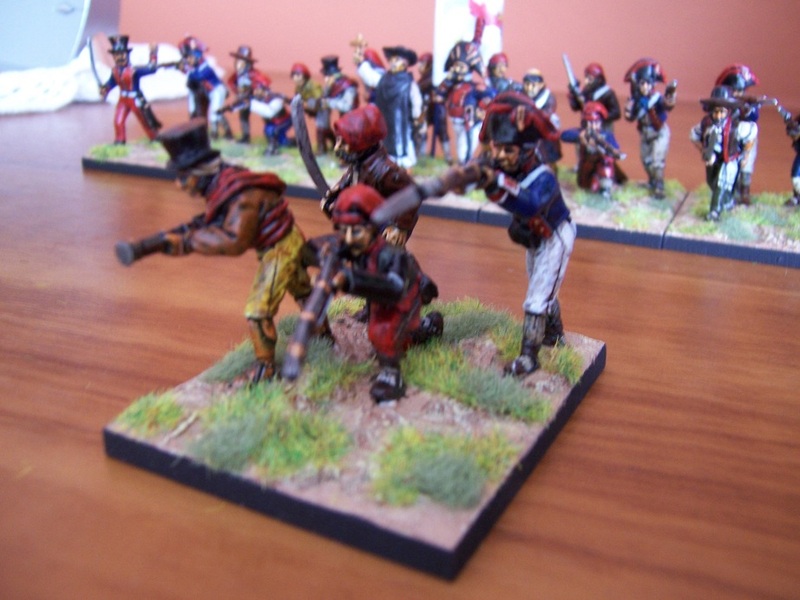 These guys were purchased ten years ago when I started a War of 1812 project. They were going to be Canadian Militia. 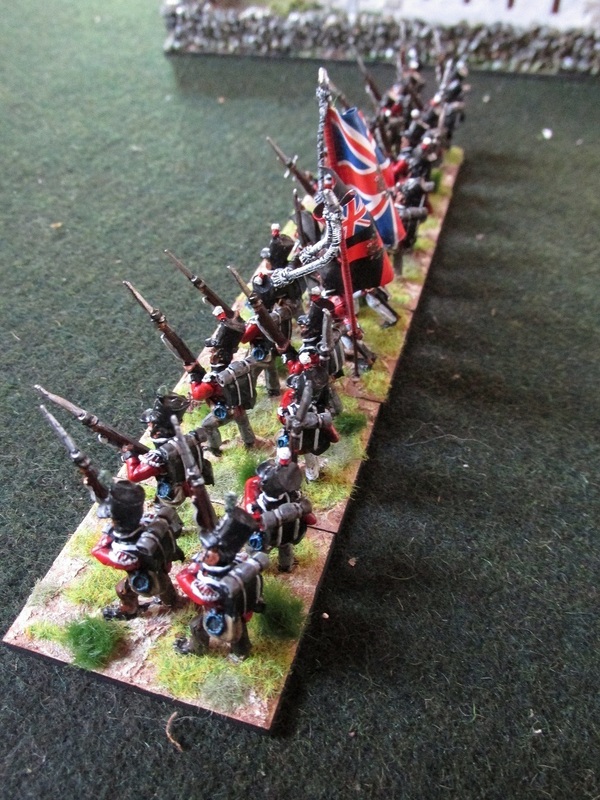 I had this Victrix flag sheet that had flags for the 50th West Kent Regiment so that is what they became instead. These are what I guess would be called first edition Old Glory. I have not brought any of the 2nd Ed ones. The main attraction is the price. With the Old Glory Army Card 40% discount they are not to be sneezed at. The 50th West Kent had black facings. 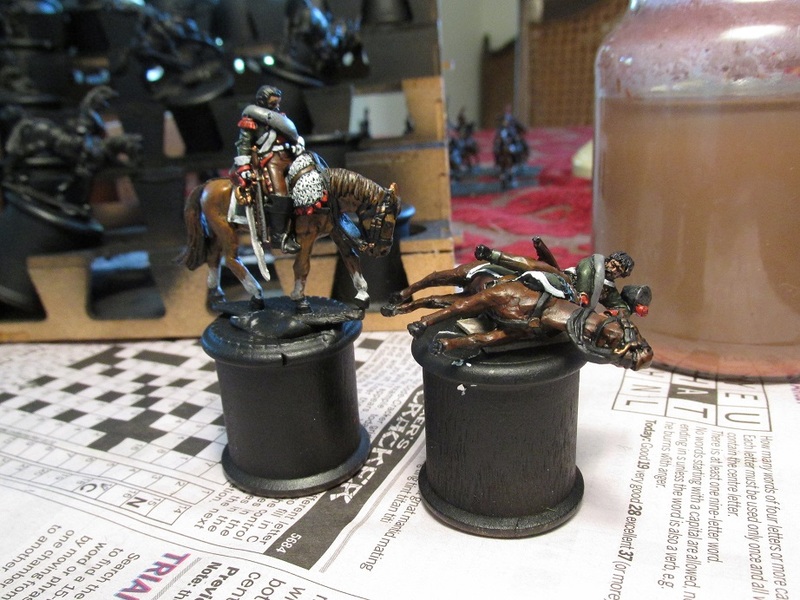 Easy to paint when using black undercoat. 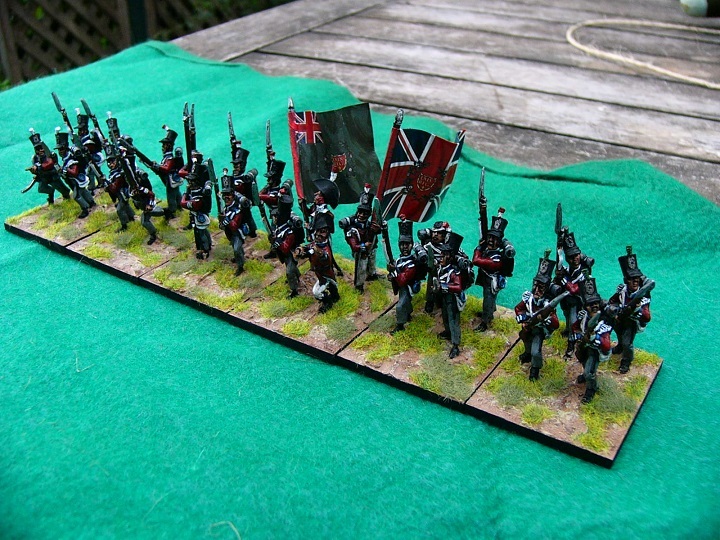 I am working towards modelling a scaled down Crauford’s Light Division for my Peninsular War project. 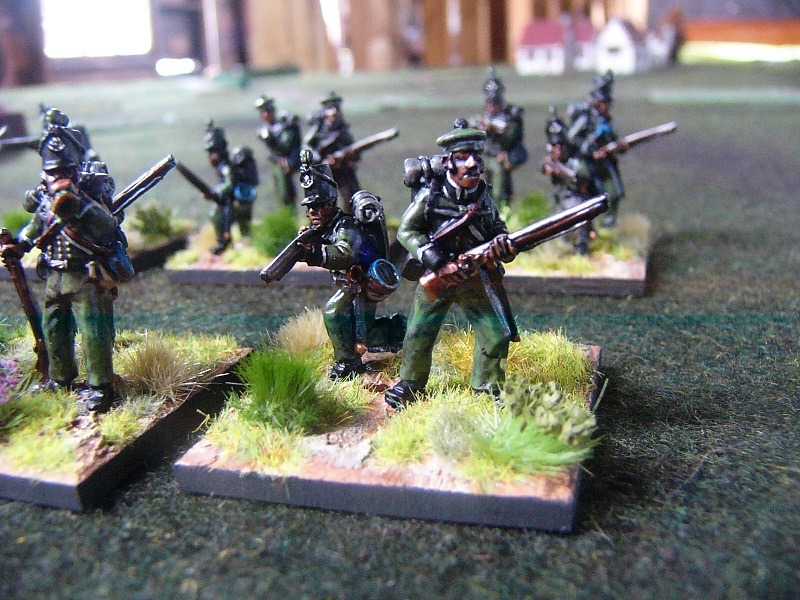 So far I have the 52nd and 43rd Light Infantry regiments and now two battalions of Rifles. One is the 60th but I am not too worried about that. 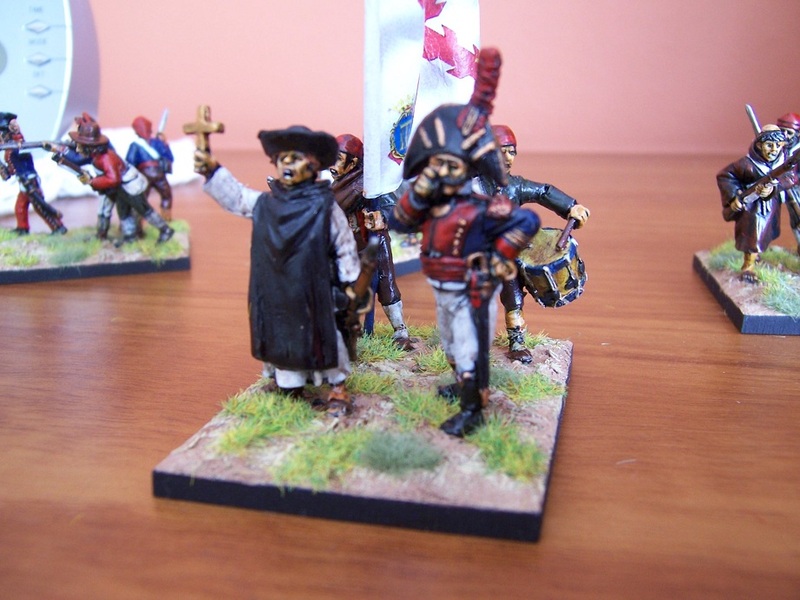 Two Portuguese Cacadore battalions are sitting in boxes on the shelf waiting to join them. On to the models I have finished. I have had these guys for about six months and knocked them out this past week. 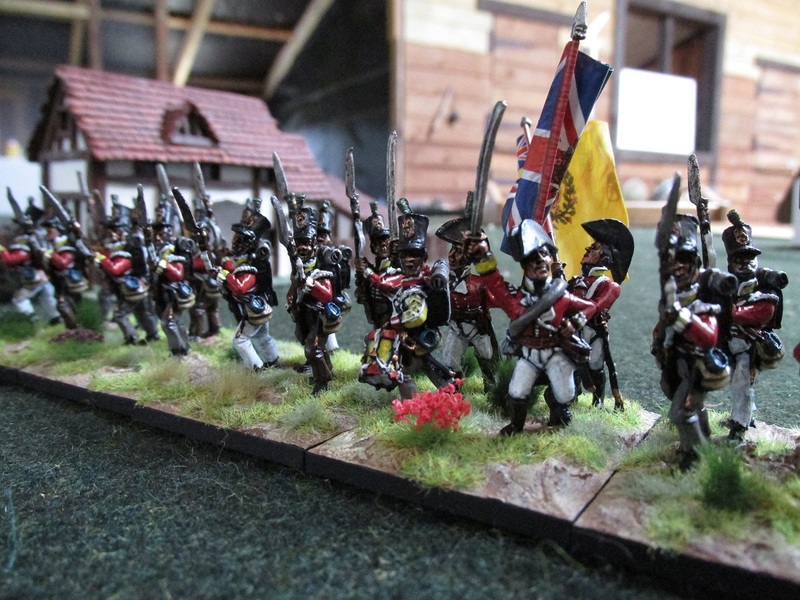 These models are all (with the exception of one Perry plastic rifleman to round the unit out to 24 models – I used on officer on a command base a while ago) are by Offensive Miniatures from their Follow the Drum Napoleonic Line. 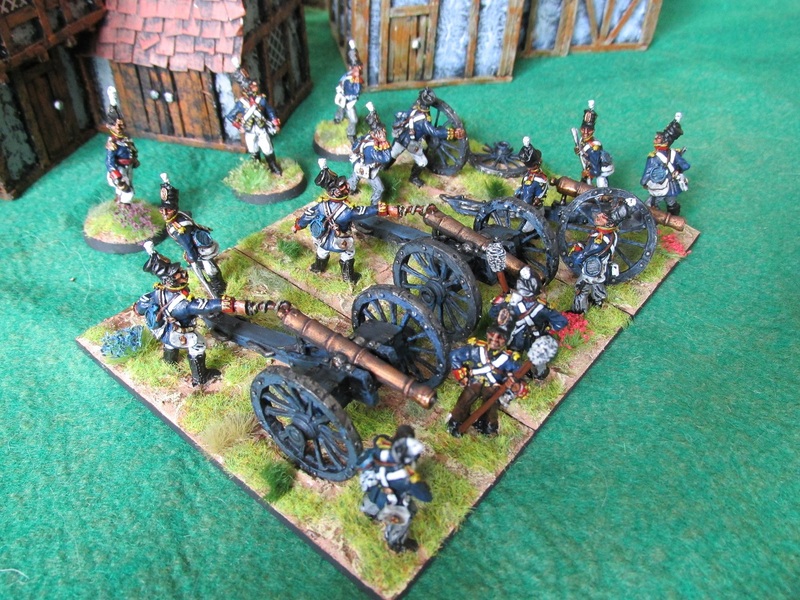 Offensive Miniatures are on the smaller side of 28mm scale but not so much as you will notice on the table top. 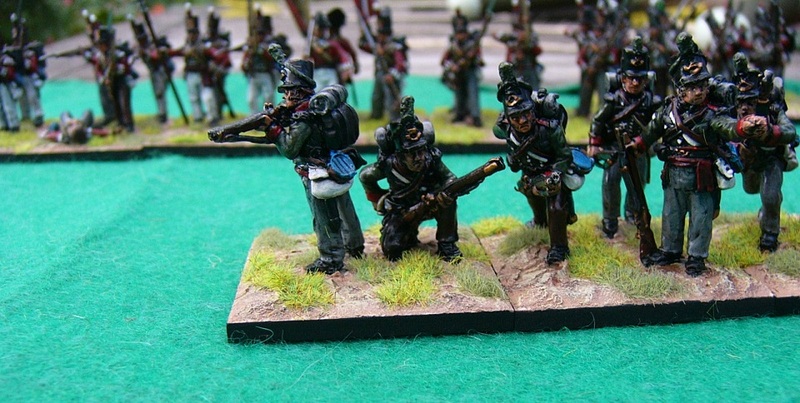 Alongside some fat Front Rank riflemen they may look a little starved, but then again, who wouldn’t? 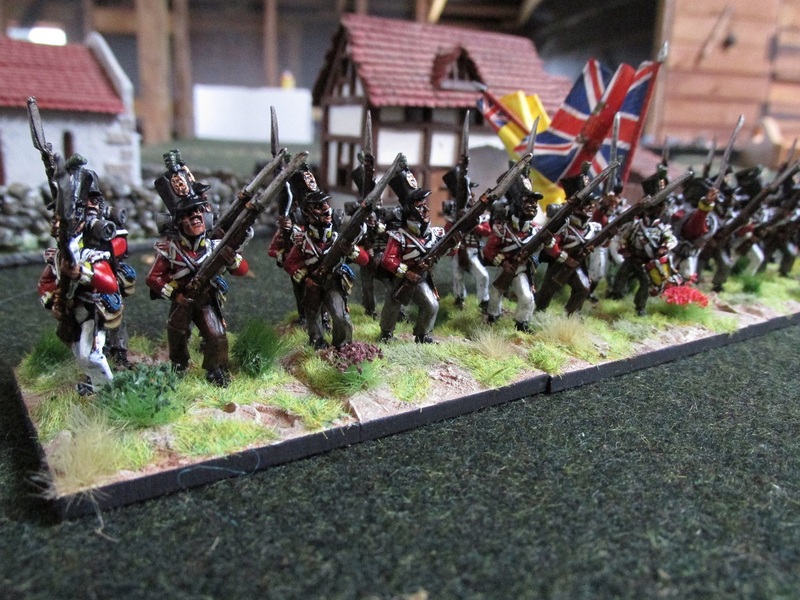 I made the unit a full 24 figures so I can use them as a single battalion or broken up into companies for Black Powder and or Sharpe Practice games. 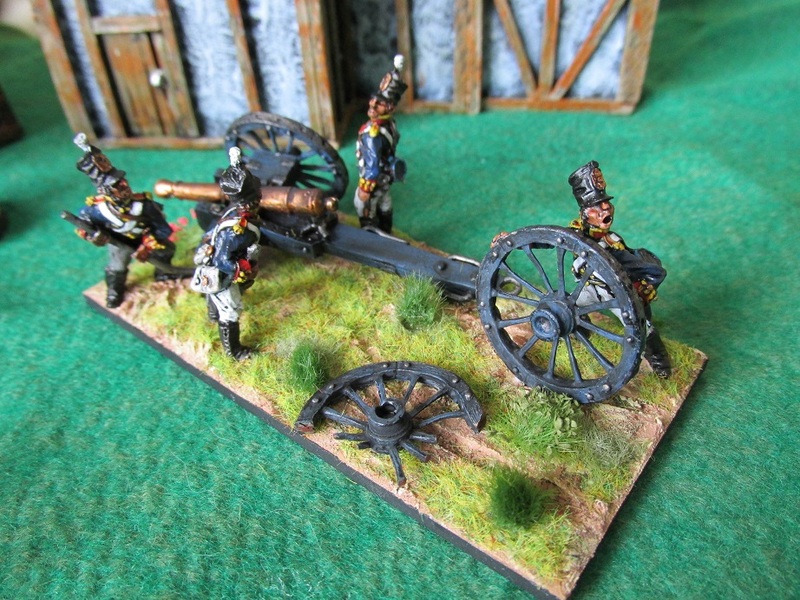 Next on the painting table is a battery of British Foot Artillery (Elite Miniatures). I took these a month or so back but couldn’t get them off the camera until I found the right cable. Old Glory have a style all of their own. People either like them or hate them. I am in the ‘Like’ category. They are cheap, especially if you use the Army Card and get a 40% discount, and come in bags of thirty figures. The staff at Old Glory also go out of their way to help you get the best value for your postage. It amazed me how much stuff they manage to cram into a standard air mail postage box. 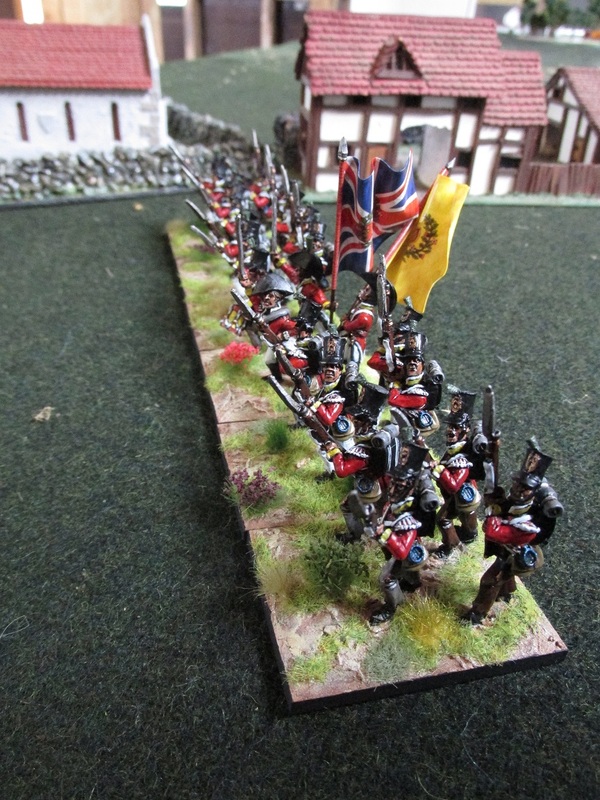 The Regimental Colour for this regiment is all wrong – but I will remedy that once I get home and replace the green standard with a blue one I have printed out. 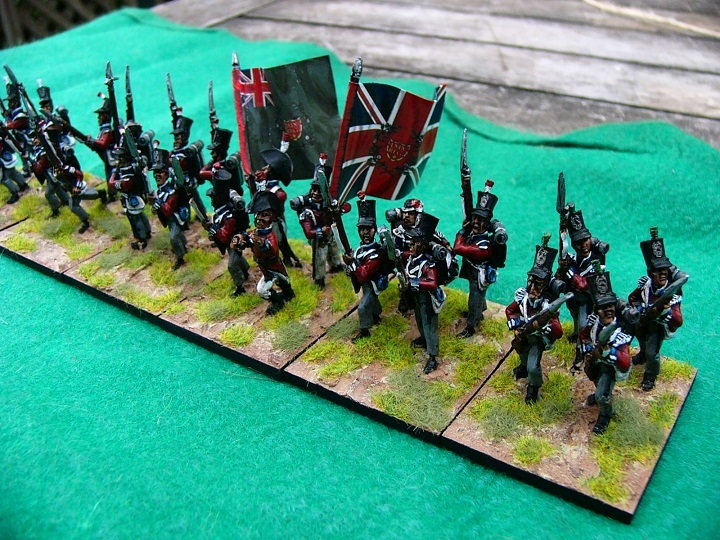 For the sake of uniformity I have decided to base all my British and Allied line infantry on 40x50mm bases. As I said in an earlier post I went to the 50mm deep bases because I am paranoid about protecting the plastic bayonets on my Perry and Victrix plastics. 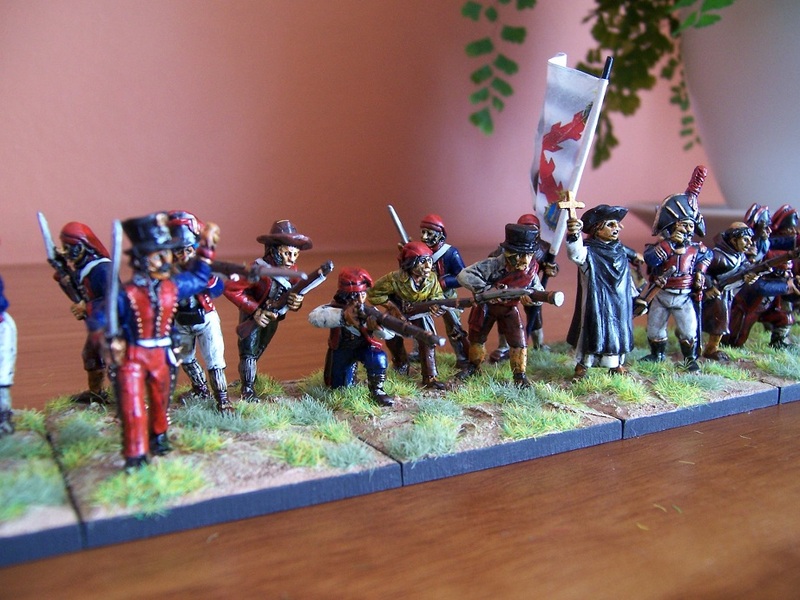 In typical Old Glory fashion there are a few highly animated, and somewhat goofy looking figures amongst this lot. The officer on the command base is no exception. This battalion has a complete stand of flank company infantrymen at each end of the line. 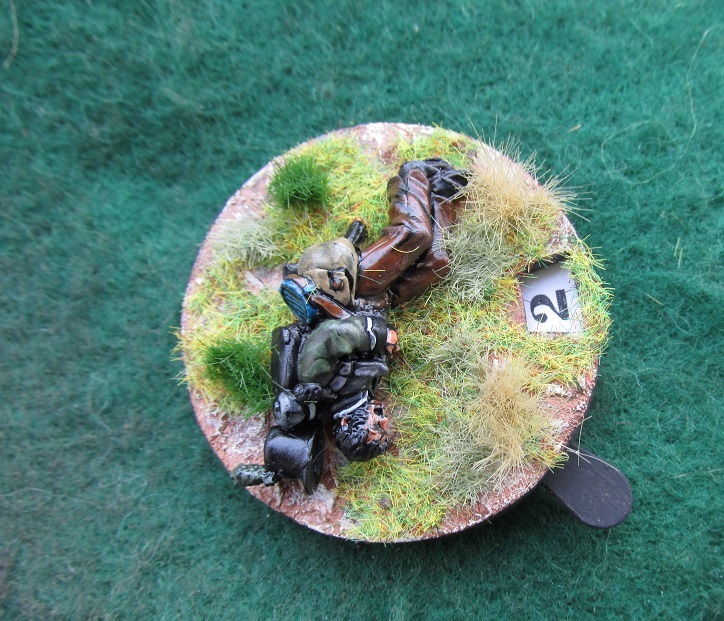 My plastic battalions, and any further metal ones, have only two flank company figures on a base that they share with some centre company companions. You will also notice that this battalion has reversed tufts on their shakos. The centre companies have red over white instead of white over red. An eccentric Colonel no doubt. I really like these two Sergeants. The one with the pike is a neat little model. 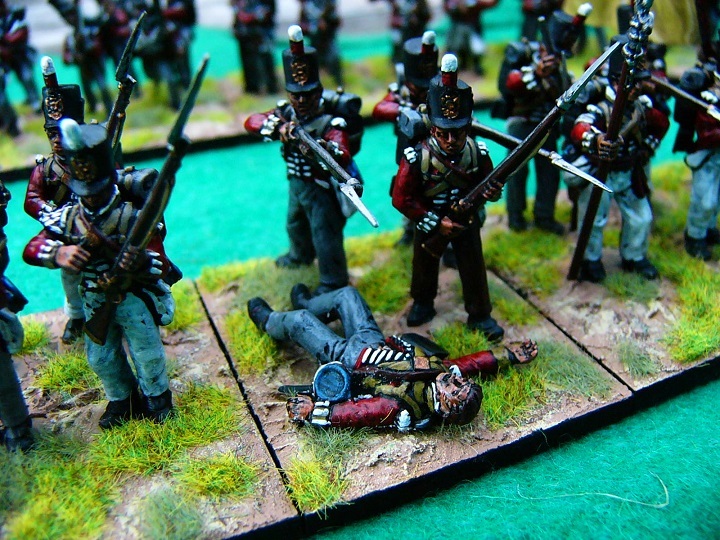 There are two with pikes in the 1808 British Infantry command bag, but the other one is nowhere as good a pose as this guy. 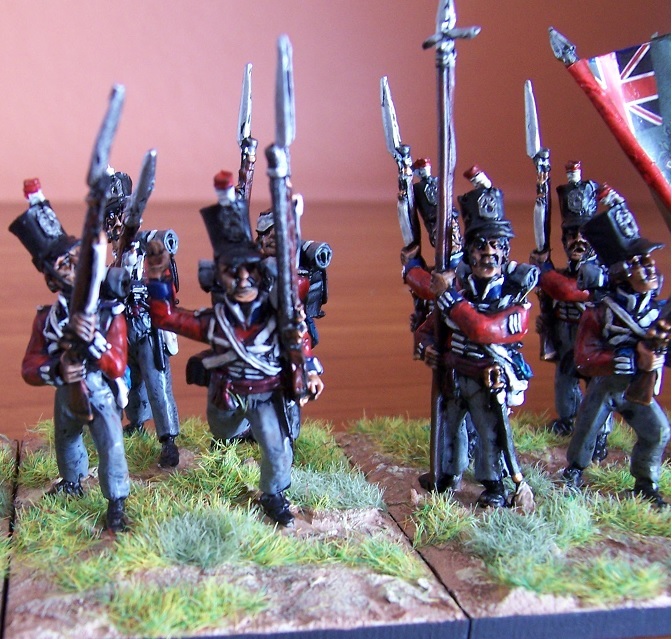 I have finally finished my first 28mm British brigade for my Peninsular War forces. 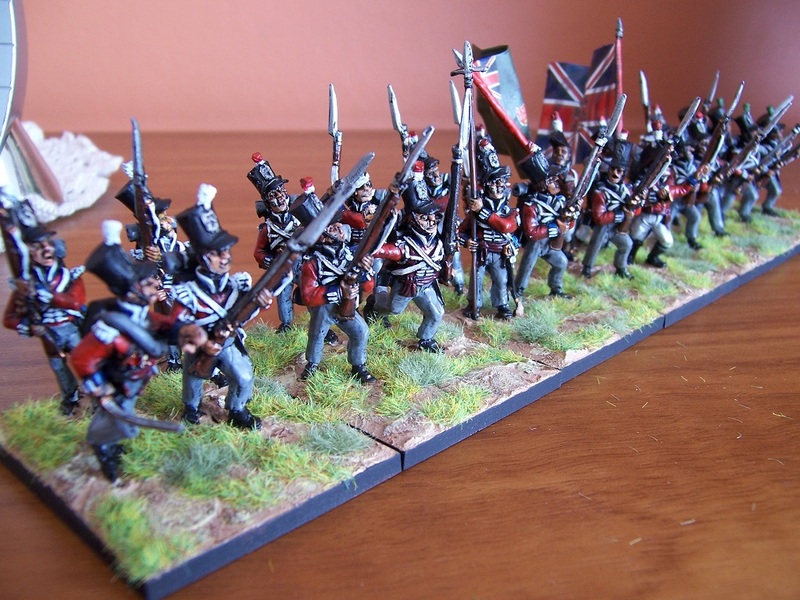 I have never painted British infantry before and found it surprisingly refreshing after so many battalions of blue coated Frenchies. 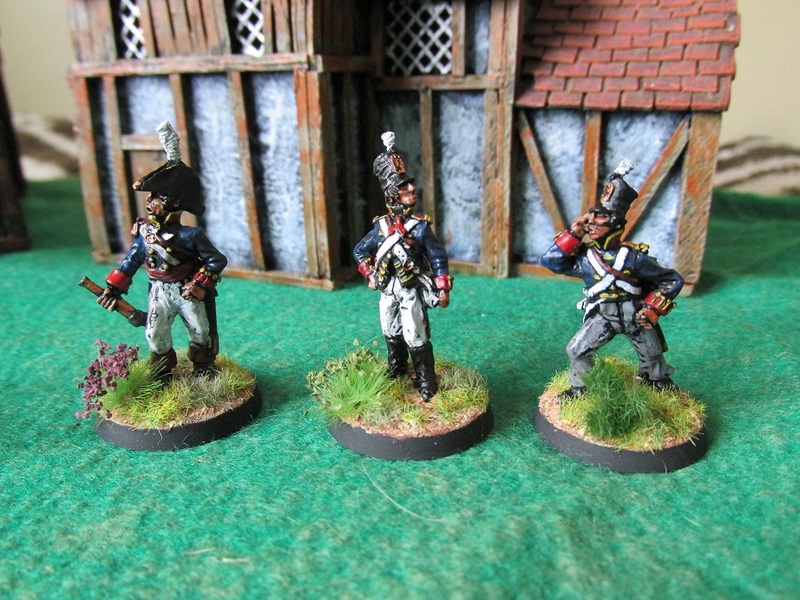 There is also something rather cool about those big colours – and you get two in a battalion. Probably one of the reasons British infantry in line look so cool. 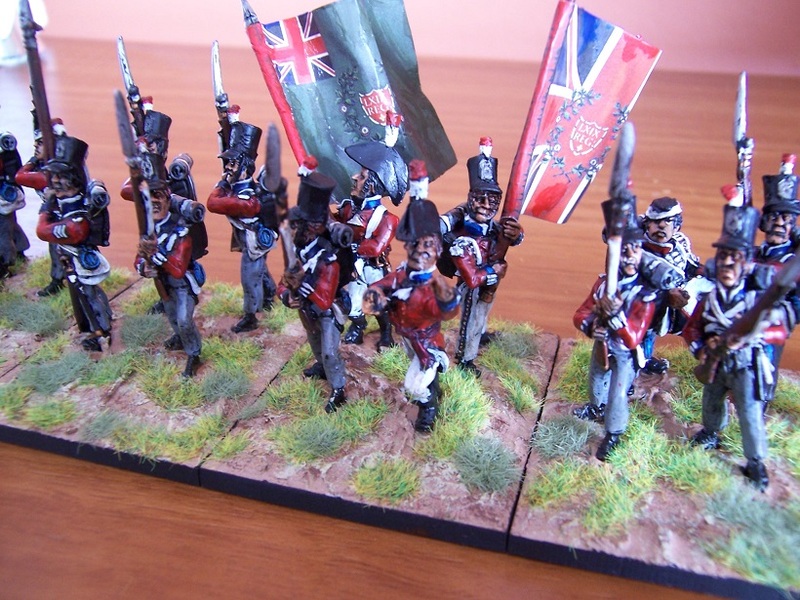 I had got some Old Glory 1st Ed British Infantry in Stovepipe Shakos years ago that I was going to paint up as Canadian militia for War of 1812. 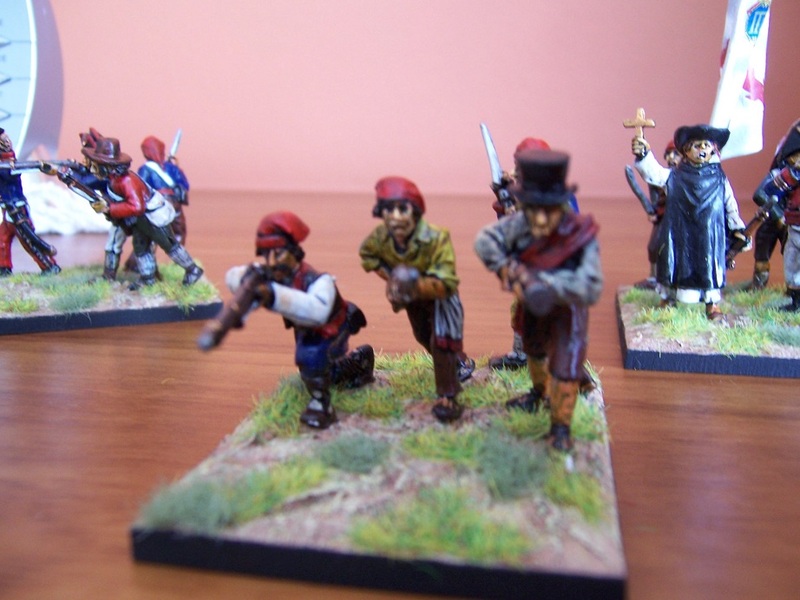 They are typical Old Glory miniatures – very quirky. However, quirky is something I like. Not too clear but there are a couple of sergeants in this shot. One with pike and one waving his men forward. 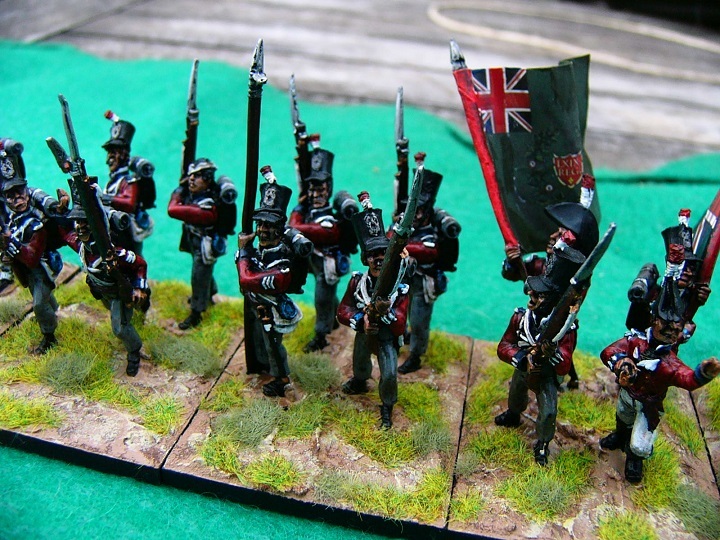 The eagle-eyed amongst you may notice that the flag is wrong for the facing colours of this regiment. I wanted to base them and didn’t have the right flag. Oh well, How sad, Never mind. These Old Glory figures are pretty good and easy to paint. They are not as small as I thought they would be up against modern 28s. 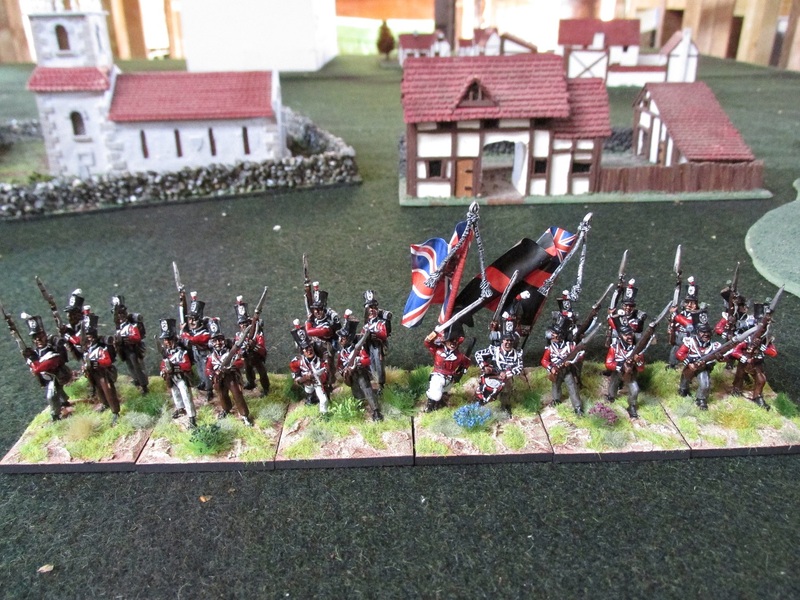 The second battalion in this brigade is the 37th – constructed out of the Perry plastic British Infantry set. My painting guide was the one that came in the box. I am nothing if not thorough in my research. 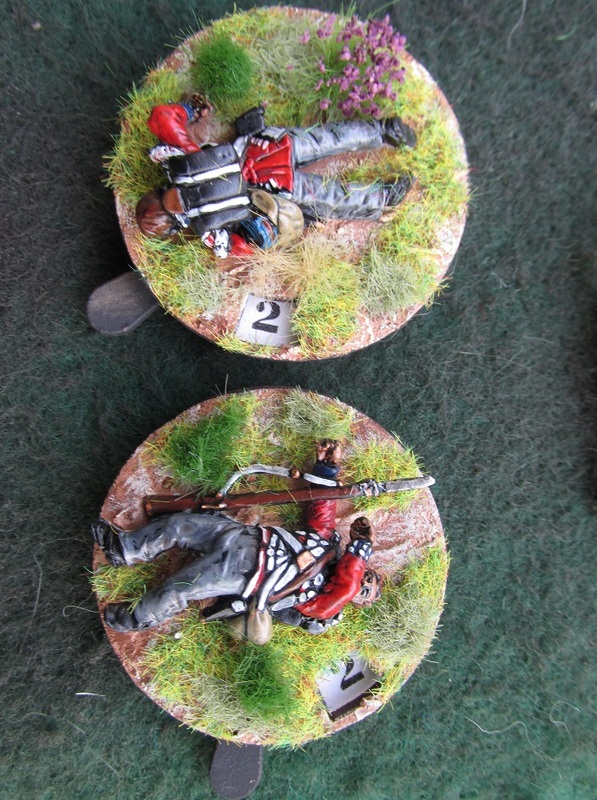 I used the British casualty figure from the Perry Cuirassier/Carabiner set to tart up the firing line. 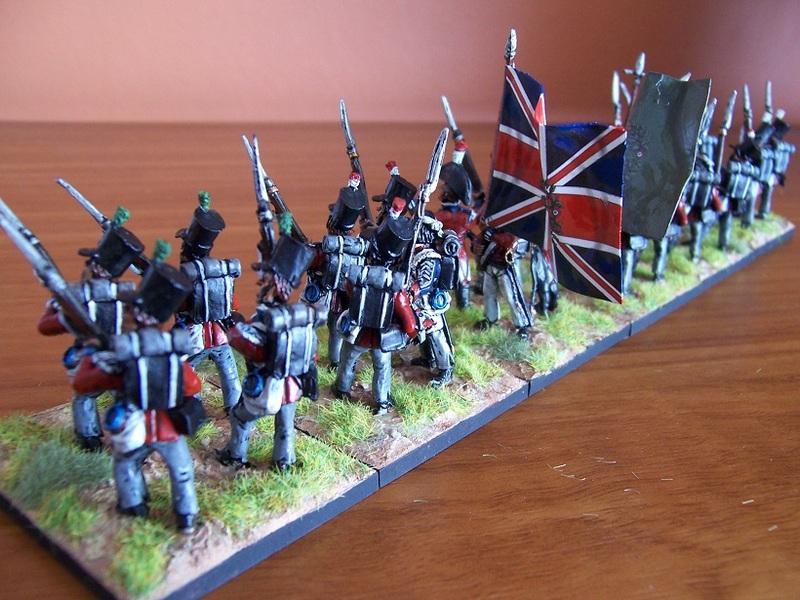 When I did the Old Glory battalion I used a base for each Flank Company. 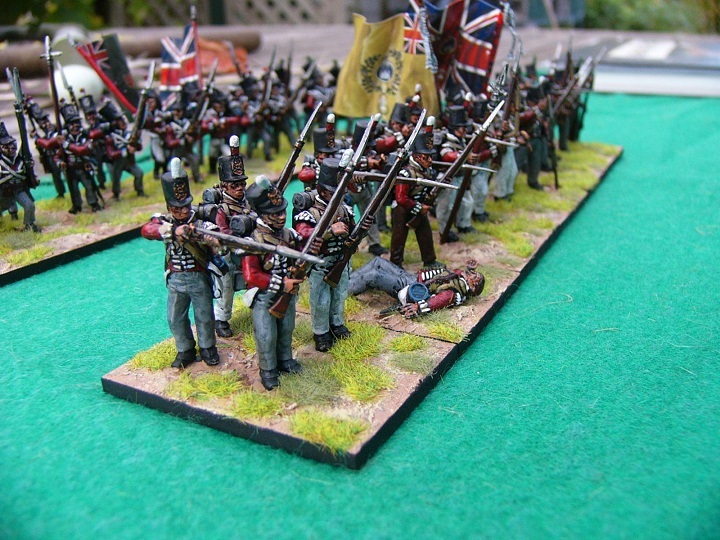 That was too many, so for the Perry battalion I used a couple of figures at each end to represent the Grenadiers and Lights. A rear view of the Perry Battalion. 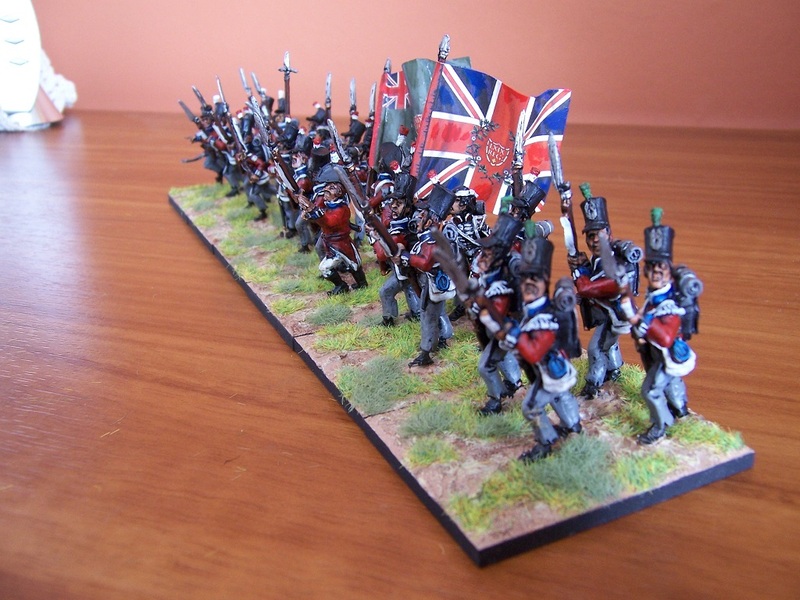 The last battalion I painted was a battalion of the 60th Rifles. 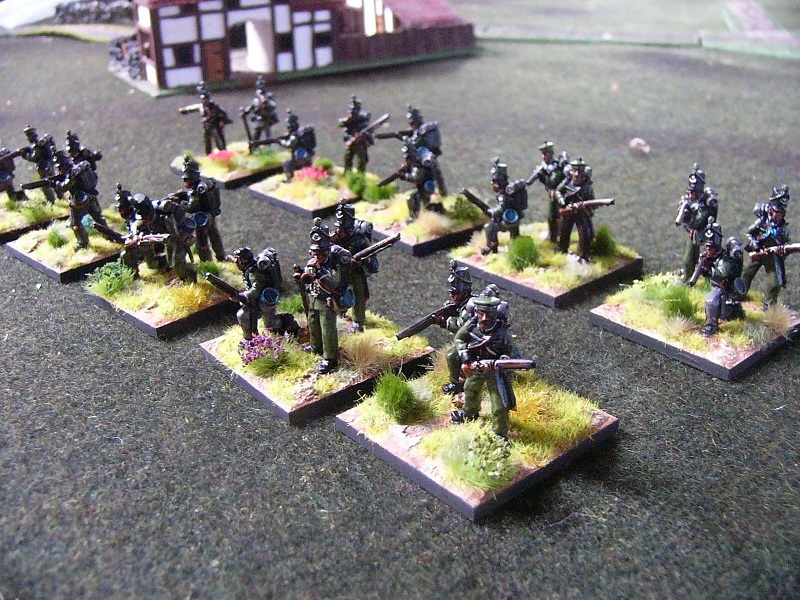 Once again these are Perry metals and plastic riflemen. On TMP I had wondered about the compatibility of the plastic and metal figures on the same bases, but it turned out better than I expected. 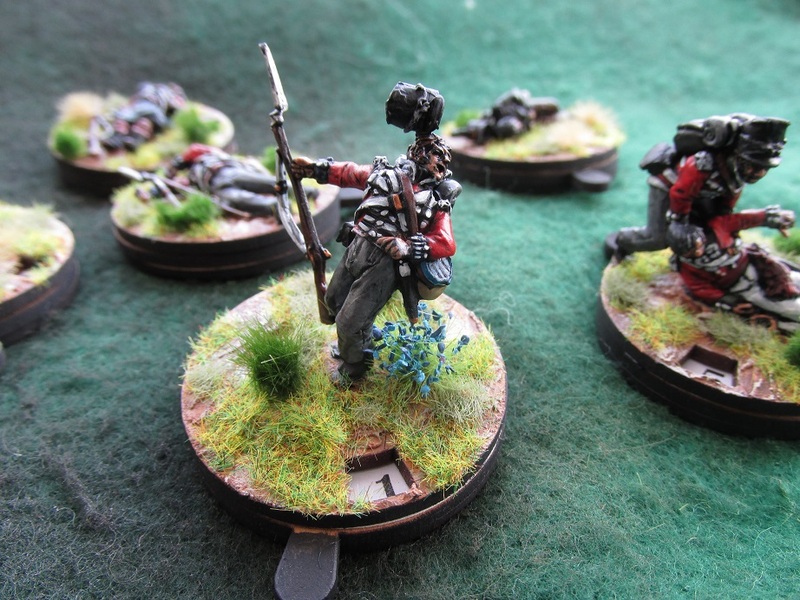 I put the plastic riflemen either at the back of a base, or together on one base. Seemed to work out alright. I really liked these metals. 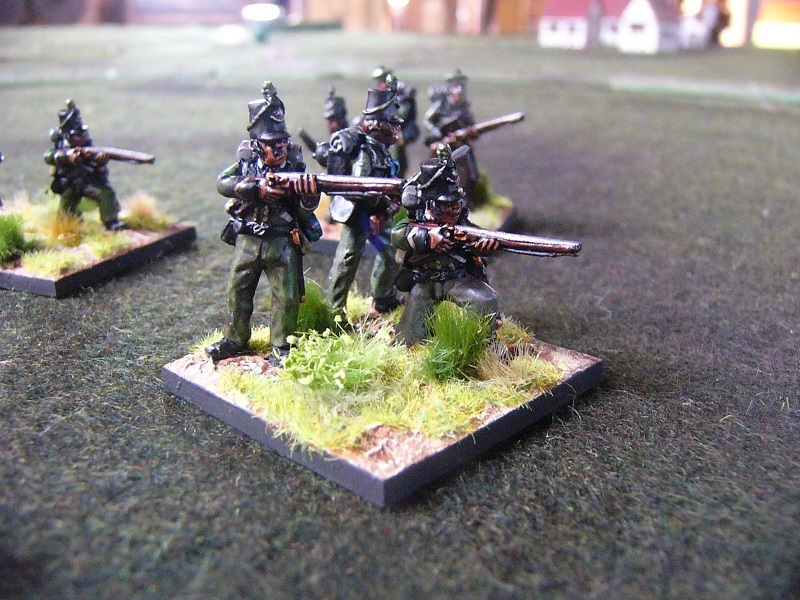 I see another battalion of riflemen in my future – this time the 95th. Who makes the best Sharpe and Harper that will go well with Perry’s? 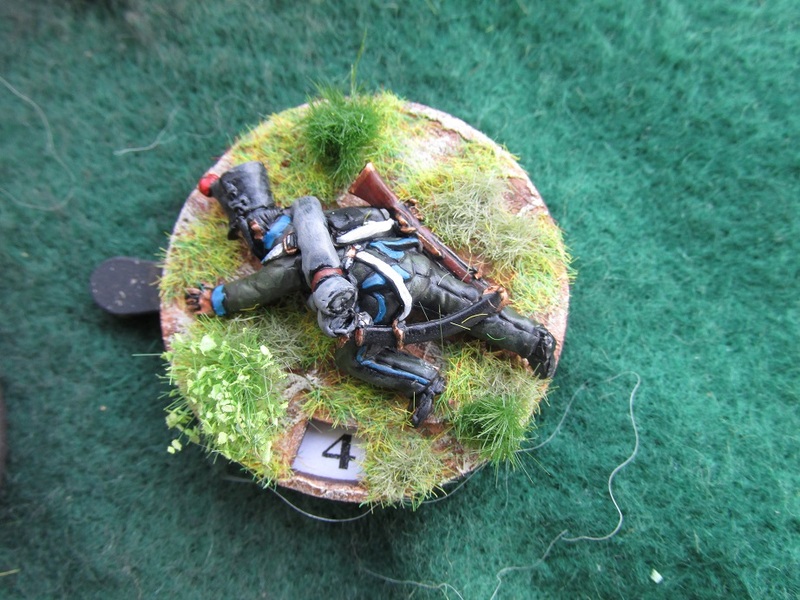 The next unit on the painting table is another plastic unit – this time Victrix. I have assembled the 24 man battalion in stovepipe shako and with the front rank kneeling to receive a charge with a firing line behind them. 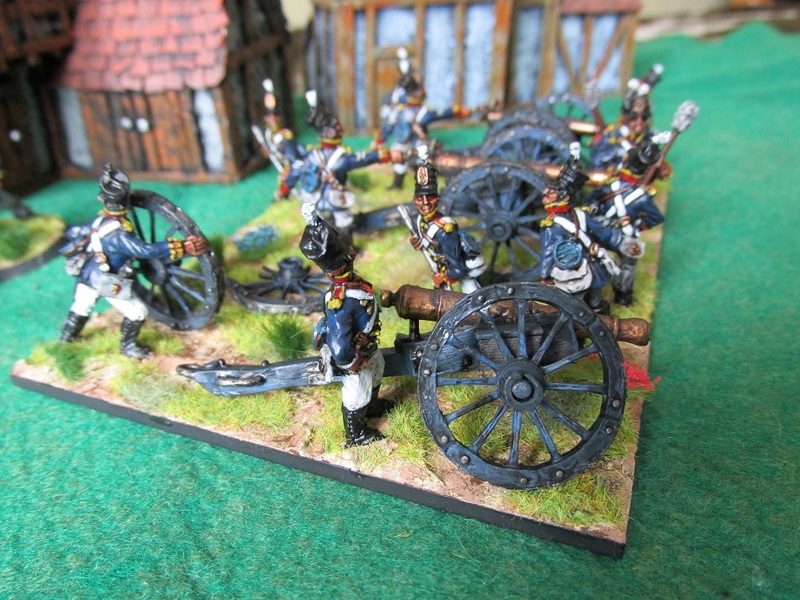 My latest unit and the first of my 28mm Spanish Napoleonic project. These figures are from Brigade Games. The codes are Spanish Rebels I, Spanish Rebels II, Spanish Rebels III and Spanish Rebels Command 1. The Officer commanding is a single model code Spanish General. 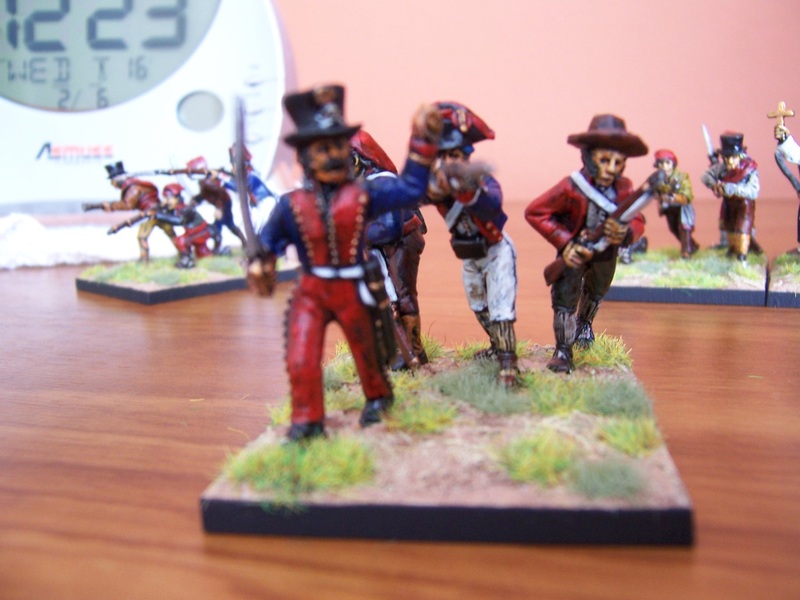 I also brought Spanish Rebel Woman with Musket but did not include her in this unit. She will be painted separately as part of a guerrilla unit. She bears more than a passing resemblance to “Teresa” from the Sharpe TV Series. These models are fabulous. 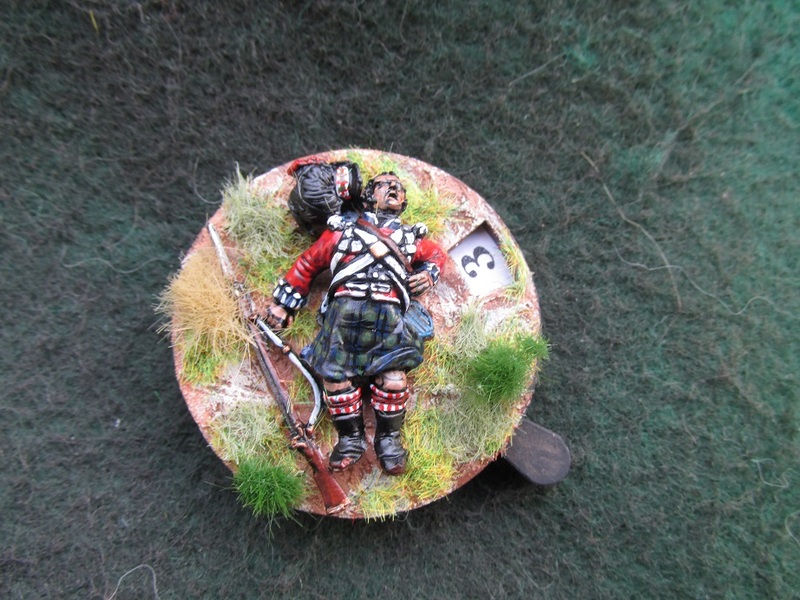 Nice detail, no flash worth mentioning and pretty easy to paint. I did not use any reference material for these guys so just painted them how I thought they should look. 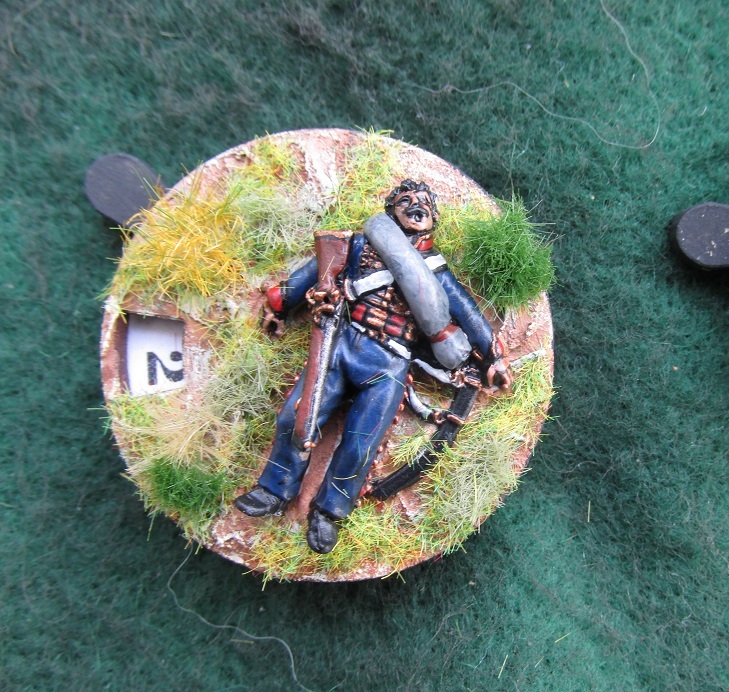 The Brigade Games range do not have a standard bearer so I converted a guerrilla who had a pistol in his left hand to instead be holding a flag. The flag is one I found on the internet, re-sized and printed. 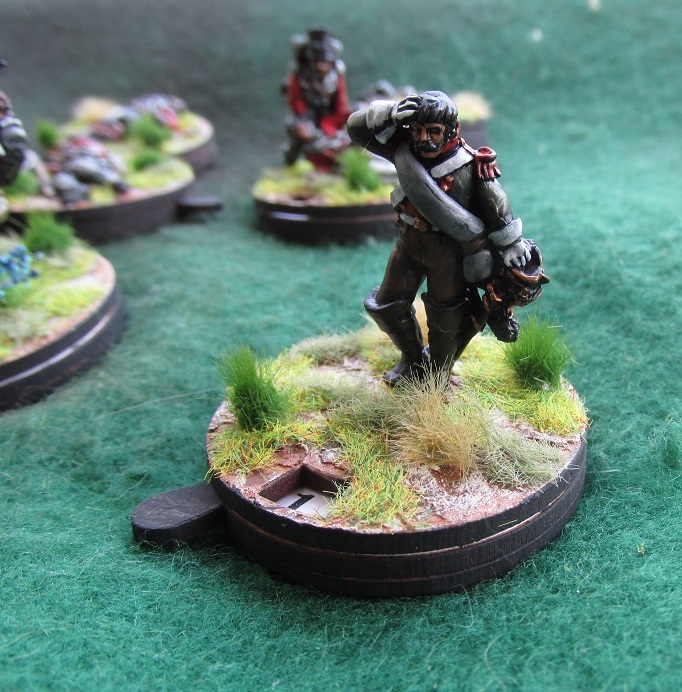 The models are based on laser cut mdf bases from Australian company Back-2-Base-ix.